On July 16, 2009, we checked out the site of the former Atlanta Braves stadium that was known as Atlanta Fulton County Stadium. 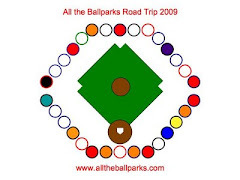 It is not exactly hard to find and is really something everyone that goes to a Braves game should check out since it is right there in the Green Parking Lot across the street from their current ballpark, Turner Field. The most historical moment at this stadium was probably Hank Aaron hitting his 715th career home run over the left field wall, which broke Babe Ruth’s career home run record. The outline of Atlanta Fulton County Stadium’s field is recreated with a red brick warning track around what used to be the field, but is now a parking lot. The brick is also used for the other parts that would have been dirt (i.e. the base paths and batters box). While all of the brick is just meant as a recreation of the field look there is something that is original to the park. The thing that is original to the Atlanta Fulton County Stadium and still remains in the middle of what is now the parking lot is a piece of the outfield wall. This piece is the wall Hank Aaron hit his 715th home run over on April 8, 1974. A baseball shaped marker is placed on the preserved piece of the wall. The marker says Hank Aaron Home Run 715 April 8, 1974. The main thing to see is the piece of the outfield wall, but you can also find the locations of the original bases, home plate, and pitching mound. This is not too different than we have found in several other parking lots on this trip (i.e. Comiskey Park, Veterans Stadium, Shea Stadium). The markers, however, are metal plates rather than stone like the others. They sure get hot. I usually pose by the home plate and touch the home plate while Dad takes a photo, but it was too hot to touch them, so I just had my hand close to it. If you are going to do old ballpark hunting in a parking lot only once, this is the one to not miss. The other ones are cool to find, but this is one is the most interesting because there is actually a piece of the park kept there. I also like the brick marking the dirt areas of the field. However, the metal plate markers look like a cheap way to do it and messes up the otherwise well done marking of the old stadium.